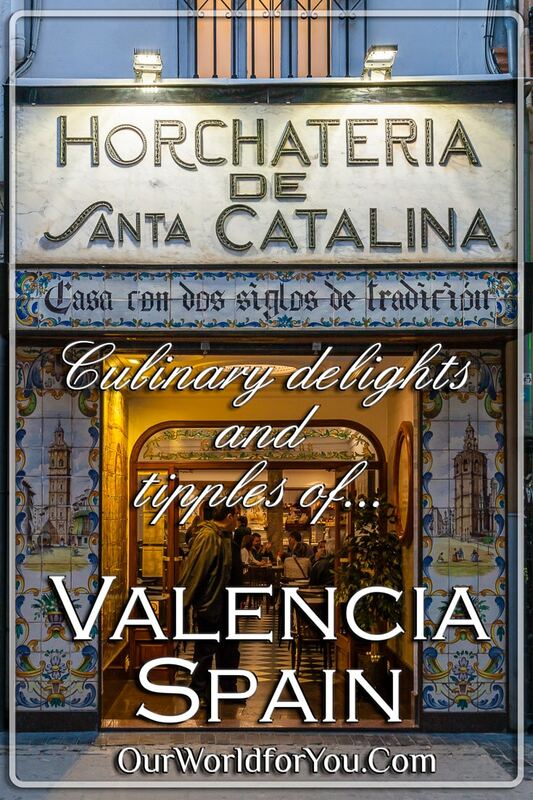 One of our favourite memories of a town, city or country, are the delights of their local food and drink; Valencia is no exception. 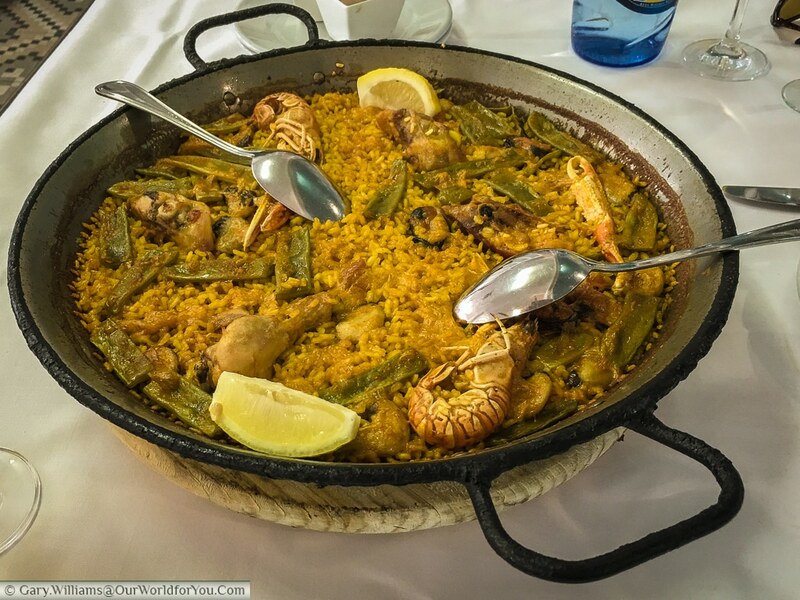 Valencia is the birthplace of Paella, (I need no other excuse to go there), this wonderful dish is not only a delight to taste buds but also a spectacle to the eyes. Traditionally, in Valencia, the main ingredients of their paella consists of white rice, chicken or rabbit, green beans, white beans and artichoke when in season (some recipes may vary, so don’t hold me to this). Scraping the crispy baked rice from the bottom of the paella pan is a must. I really wouldn’t want the job of cleaning those pans though. Usually this dish is for a minimum of two people and is often cooked from scratch, so you may have to wait half an hour. Don’t let the wait bother you, sit back, take in the sun, and have a sip of your Agua de Valencia. On this Valencian mini break we only had the chance to sample paella once, as there were too many other delights we wanted to try out. 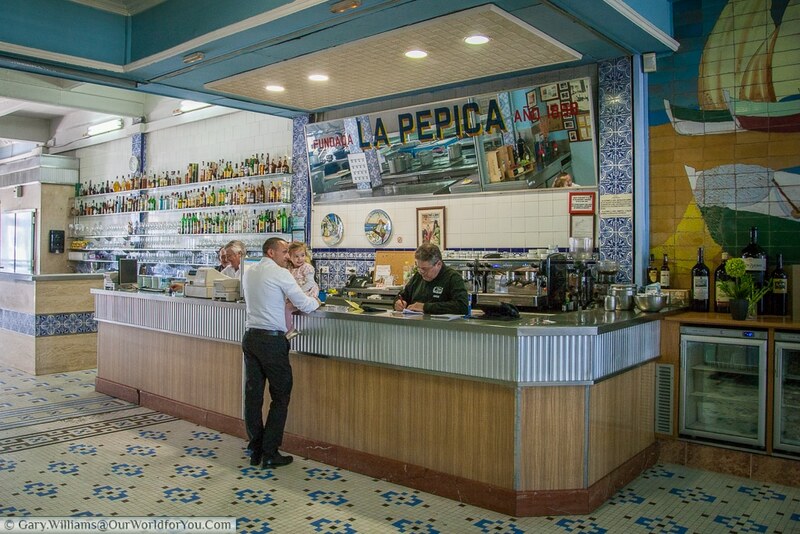 We opted for the historical, award winning, La Pepica, which is on the sea front overlooking the beach Playa de la Malvarrosa. Another specialty in Valencia is horchata de chufa, accompanied with fartons (stop it; I can hear you sniggering). 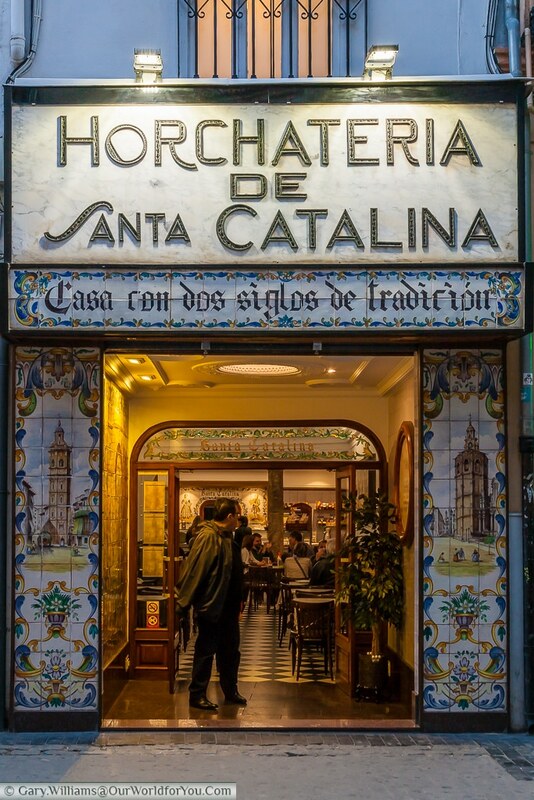 We wanted to try our first horchata in a traditional Horchateria, and we particularly liked the look of Horchateria Santa Catalina, in the heart of the old town. The Spanish form of horchata de chufa, uses chufa nuts also known as tiger nuts and is usually served in a long tall glass. This ice-cold drink is very refreshing and very moreish, it certainly didn’t hang around long on our table. But what you really should try with it are fartons, these are light pastry fingers dusted in icing sugar and are dipped in the horchata, it is actually really tasty. So much so that we revisited the horchateria again just before we left Valencia. 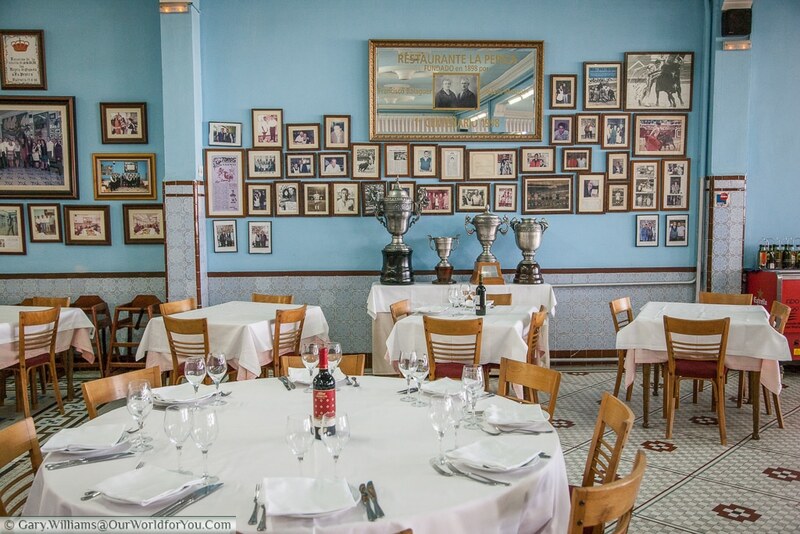 It became one our top 12 things to see & do in Valencia. 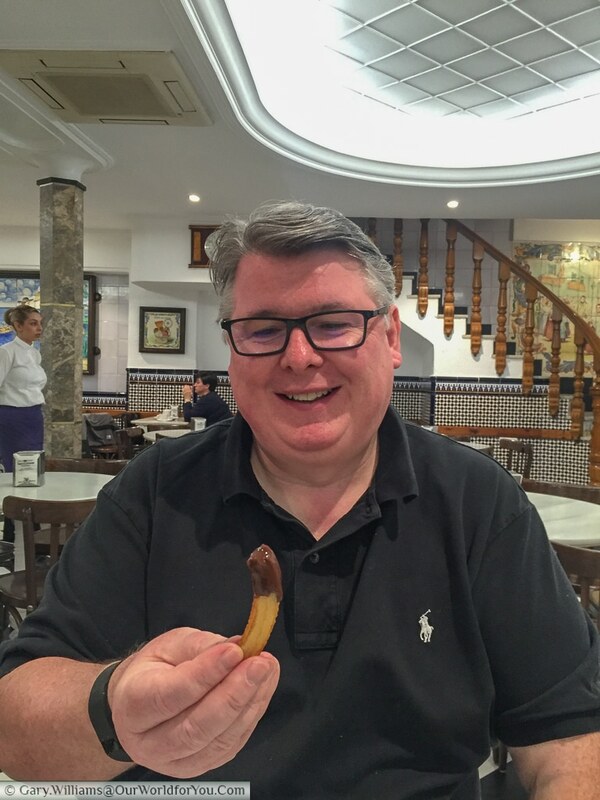 Another popular treat I really enjoy, but a bit of an indulgence, are Churros and a hot chocolate sauce. The challenge is dipping the hot, crispy, sugar coated, dough stick, into the hot chocolate sauce and then into your mouth, without letting it drip everywhere; mmmmm…. 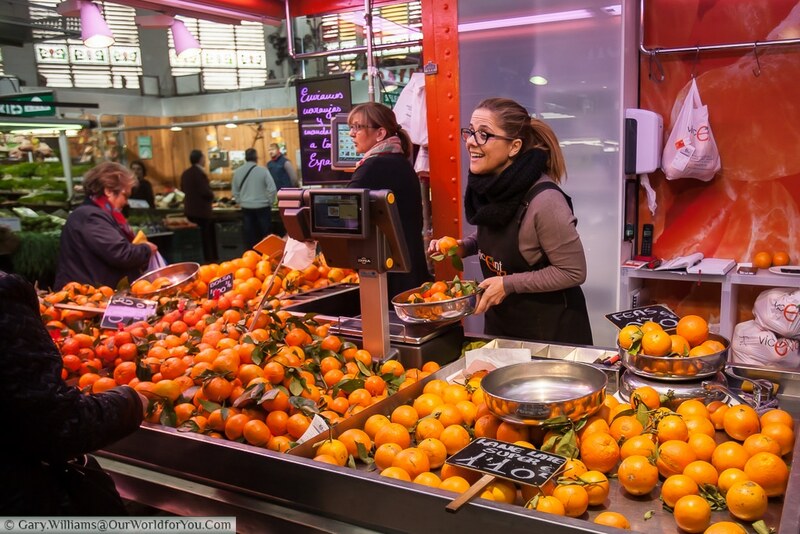 I could not write a post on food and drink of Valencia, without mentioning oranges. Street after street the trees are dripping with these wonderful gems. There is no surprise then that the local refreshing, alcoholic, thirst-quencher, is Agua de Valencia. We had a particularly nice one in Tasquita La Estrecha. In the Spanish sunshine this is an easy competitor to Sangria, it is made up of orange juice (of course), Cava, Vodka, Gin and ice, give it a try I’m sure you won’t be disappointed. If you’re interested in trying it yourself – here’s the recipe. 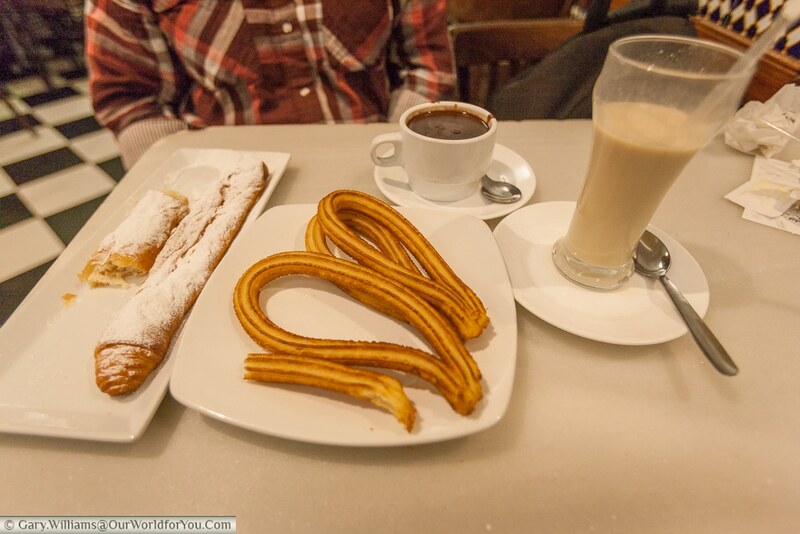 There are so many things to love about Spain, and another one is the late evening eating. 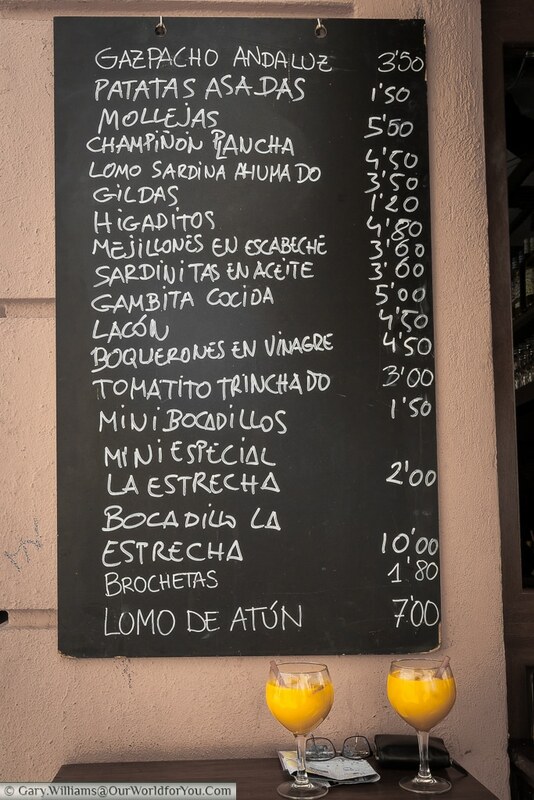 We found some fantastic tapas of really high quality. 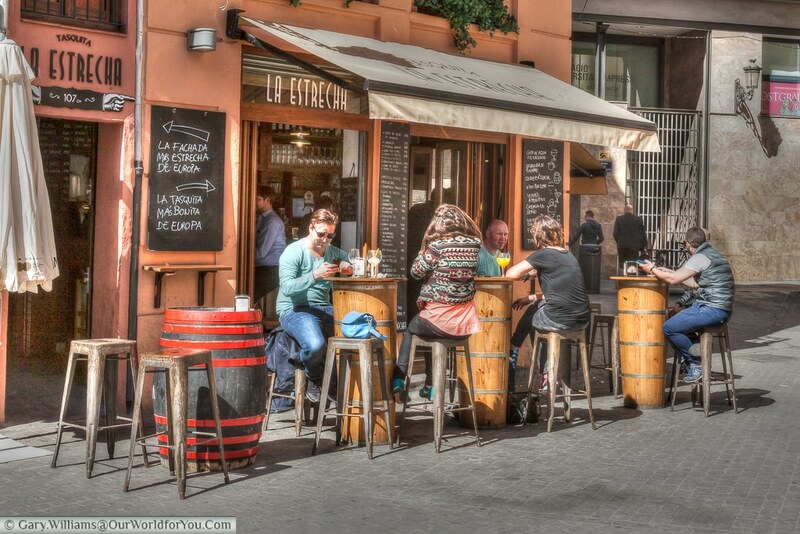 We were in Valencia for just 3 nights, so we only got to try a few cafes and bars. 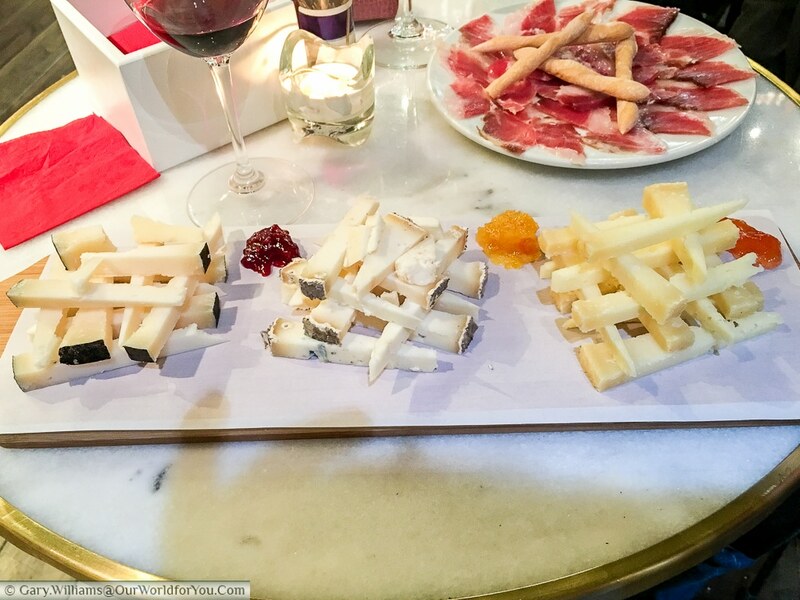 One of which was Colmado Lalola, the jamón ibérico de bellota and cheese and marmalade selection were wonderful, obviously washed down with a glass or two of Rioja. 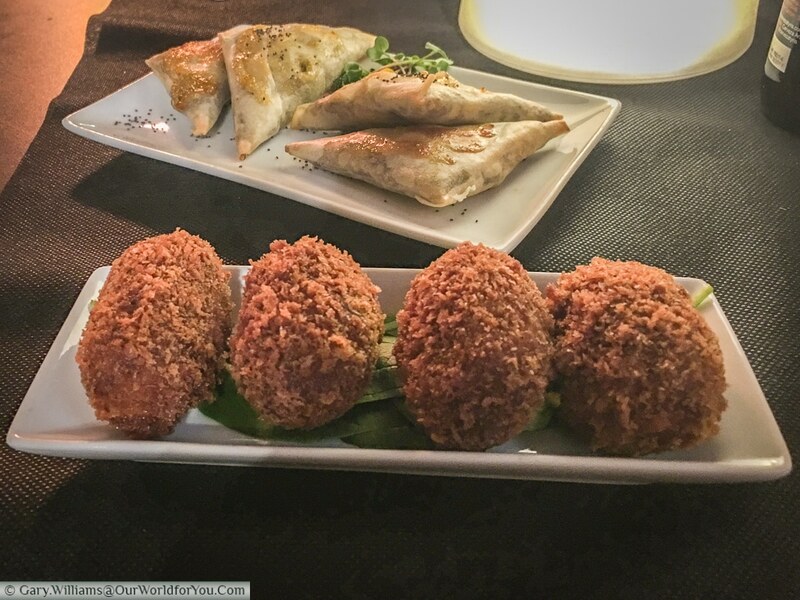 Café La Infanta was also a lovely experience, exceptional crunchy homemade croquettes. We sat outside on the terrace as it was a lovely evening, but do have a quick look inside. You step down into a wonderful bar with its exposed brick walls covered in cinematic memorabilia and a really welcoming atmosphere. One lunch time we found this wonderful little restaurant named Casa Paquito, which was full of locals. 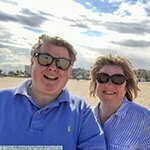 Our Spanish is quite limited (but we do try and make an effort), the staff were so friendly and tried to help us out, but at the end of the day we are in their country so we thought, lets just give it a go. It was a set menu of 3 courses for €13, how reasonable is that? 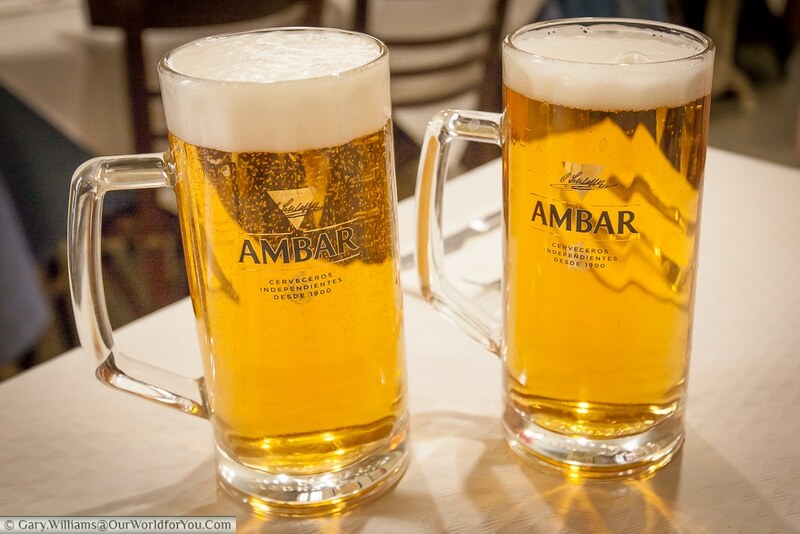 and all washed down with a refreshing Ambar. On one of our pit stops, we came across the Café Museu, this was another really friendly café/bar and had some enjoyable local beers. So much so we went back on our last day for a quick tipple and for some jamon and manchego cheese. 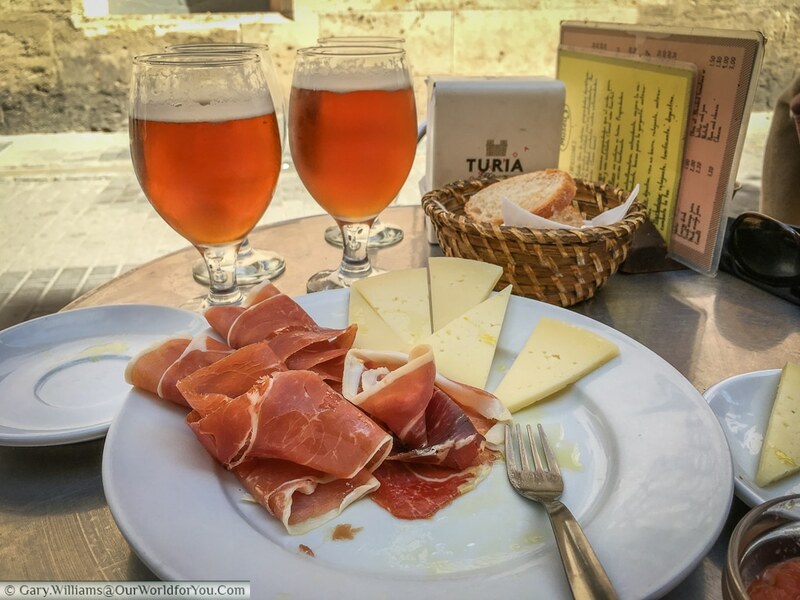 Although the wine in Spain is particularly cheap and good quality (2 good reasons to give it a go), especially if you avoid the main tourist squares, but the beers and ales are pretty good too, well so I’m reliably informed by Gary, and he should know, after his years of experience. 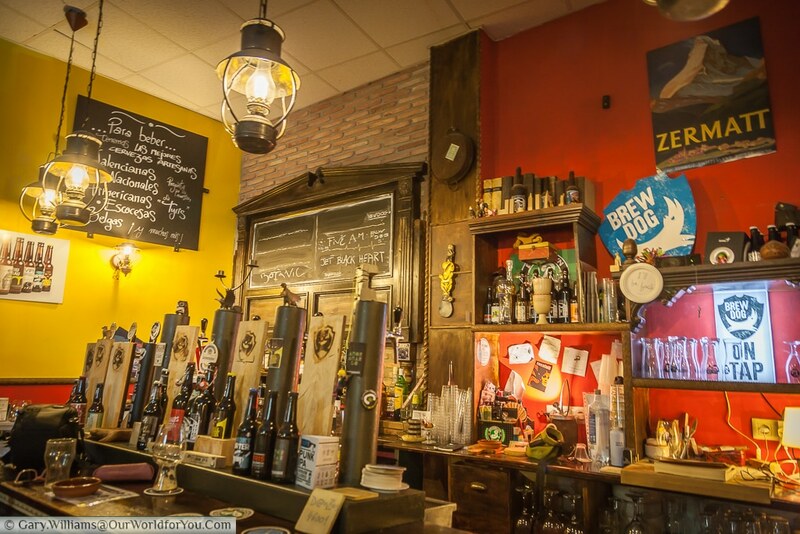 We found a craft beer bar ‘The Market Brew Dog bar’, as well as a fine selection of Scotland’s Brew Dog ales, there was also a hefty choice of local beers too. 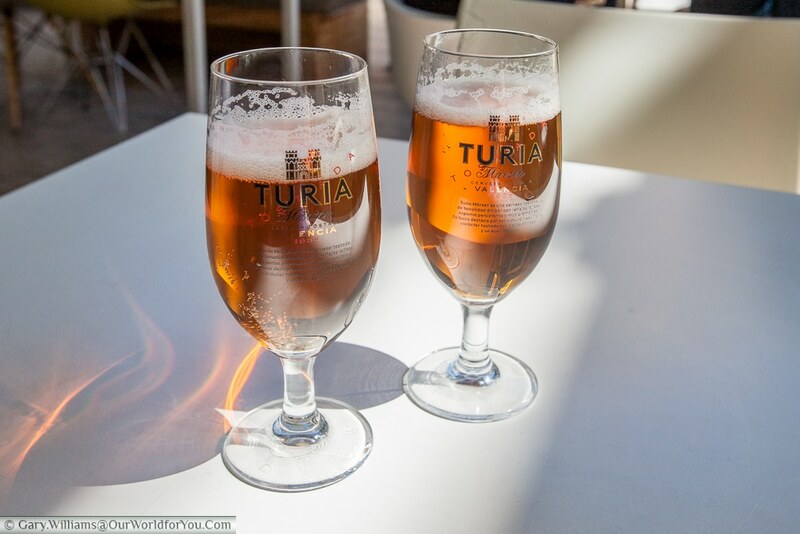 But we also found some café/bars that had local beers as well, so we had to give them ago, it would be rude not to, Turia and Ambar were particular favourites. Who wouldn’t want to try Paella in its birthplace? It’ll keep you going whilst you explore this wonderful city. Visited Valencia? enjoyed that tapas? drunk the Agua de Valencia? Did you try Paella in its birthplace?